I would like to talk about a radical thinker and changes of religion in ancient Egypt the subject of this article is remembered as Akhenaten, though originally his name was Amenhotep IV, the meaning of Akhenaten means the effective Aten. He was a Pharoah during the eighteenth Dynasty and ruled for 17 years he died between 1336-1334 B.C. The future Pharoah Akhenaten was the younger son of Amenhotep III and the Chief Queen Tiye. Akhenaten was not the crown prince at the time as it was his elder brother Prince Thutmose’s who was recognized as heir of Amenhotep III however a tragic death occurred and so he died relatively young. Which left the young Prince Amenhotep next in line (Akhenaten) by luck or fortune became pharaoh in later years. 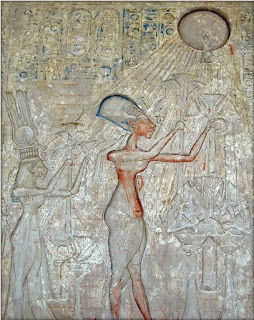 Akhenaten was especially remembered for abandoning the traditional way of religion in the Egyptian of polytheism and introduced a new radical central worship centered on Aten. Some have referred to the henotheistic, monolatrism or even a quasi-monotheistic. Earlier accounts liken that of Aten to the suns which was compared to the stars which also later led to calling Aten a god who was given a Solar deities status and symbolism above mere gods. Some would suggest this was the first monotheism religion in history many centuries before Isiah from the bible… It seemed Egypt was not ready for this radical change in thinking of Religion. The Amarna letters were important diplomatic letters which were found in modern times el-Amarna which provided important evidence during Akhenaten’s reign and his foreign policy. The early part of his reign, Akhenaten had some conflict with Tushratta who was the King of Mitanni. He tried to bring about change from the traditional religion in ancient Egypt but in the end wouldn’t be accepted. After his death many monuments were broken down, dismantled and hidden because they wanted to erase his name from traditional history they saw him as a “heretic”. Some years later the traditional way of religion was restored. When Akhenaten died the changes was happened quick. Within the ten years of his death there was political and religious change and artistic reformation which started to promote Egyptian life, like his father before him. Much of a the art and buildings were defaced or destroyed in the following the years. Akhenaten was lost from historical record and it was not until the modern era in 19th-century history at the site of Akhetaten where he built his city, which at the time was the centre of worship of Aten at Amarna. Not until the excavations at the Amarna by Flinders Petrie was interest sparked as a central interest of the Pharaoh. The style of art which flourished in the short amount of time of Akhenaten was called Amarna art, this marked a distinctive change in the art, a more of a naturalistic focus and form in all aspects of animals, plants and of commoners. This was a radical shift of war work for royal and non-royal people. The depictions of the members of the elite court and royal family have exceptional change in style particularly their facial features, change of stomach shape, wide hips and thin legs and arms (only time ever showed in Egyptian royal art). 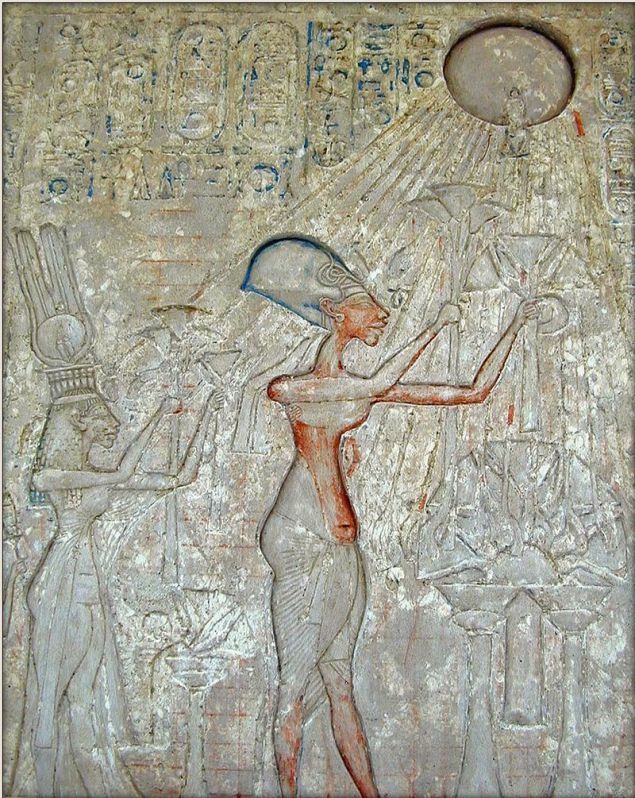 In traditional historical arts, the pharaoh was seen as divine and godly in nature.The depiction showing Akhenaten and his family had a strong focus on Aten in the light and “Great Hymn to the Aten”.